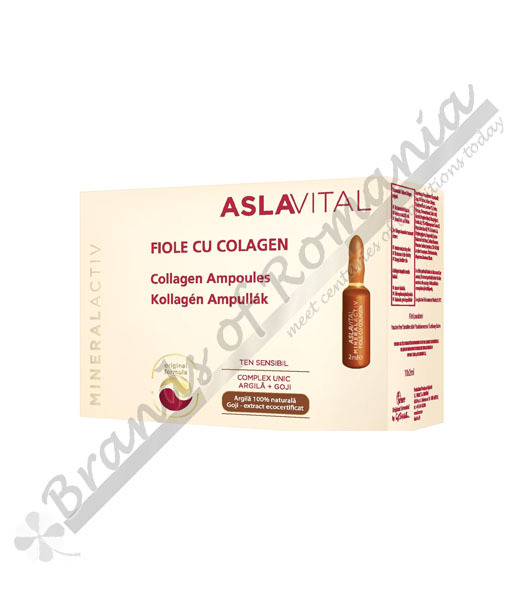 Collagen Ampoules -10 fiole x 2 ml. Repairs damaged cells and dramatically firms and hydrates the skin. Collagen Ampoules contain a serum rich in Collagen and Elastin or marine origin, Ferulan, organic Goji berry extract and Clay. Thanks to the collagen and elastin intake the wrinkles are diminished, the skin moisturizing degree is much improved. The Collagen Ampoules ensures protection against the oxidative stress through the Ferulan Complex (Rice Bran Oil and Ferulic Acid), increasing the skin protection level and giving it a younger and healthier appearance. Encourages skin tissue to restore itself. Leaves skin looking plump and youthful. Pour the ampoule content into the palm of your hand and apply on the freshly cleansed skin by gently massaging it. The entire content of the ampoule is used for a single application! Once the serum is absorbed, apply the Aslavital Mineralactiv daily care cream. Use the ampoules in the morning or in the evening in a 10-day treatment sessions.